HDM850+ is the latest addition to the VITEC decoder product line, it supports HEVC decode over 3G-SDI (from SD to 1080p60). HDM850+ is fully featured for professional broadcast applications such as content distribution, station/news automation, and quality control or simply for rendering the latest video standards. Featuring unique frame accurate playback and compatible with HEVC, H.264 and MPEG-2 video standards (HD/SD), HDM850+ is the most advanced and versatile decoder card available on the market. HDM850+ is a PCIe based decoder for use by end user as well as integrators. It decodes and displays video up to 1080p60 over 3G-SDI or HDMI. The available codecs are HEVC, H.264 and MPEG-2. File formats compatibility include MXF OP1a & OP-Atom / MOV / MP4 and MPEG-2 PS & TS. Ready for the most demanding broadcast applications, it features a hardware scaler/de-interlacer (any to any resolution), a genlock input, a 3G-SDI input for live insertion, a secondary SD-SDI output and a full frame OSD (with alpha blending) and several analog video (YPbPr, RGB & RGBHV, S-Video and Composite) and audio outputs (8x AES digital audio outputs plus 2x unbalanced audio outputs). 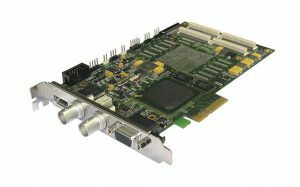 A SDK/API developer kit allows one or several HDM850+ decoder cards to be integrated and controlled into a video system quickly and easily. SDK compatibility is ensured across the complete Stradis product range allowing a seamless upgrade to a different decoder. HDM850+ is also compatible with the Livewire framework of our VITEC encoder product line. Based on this technology, LW Player, a powerful end user decoding application, provides a rich plug and play experience.